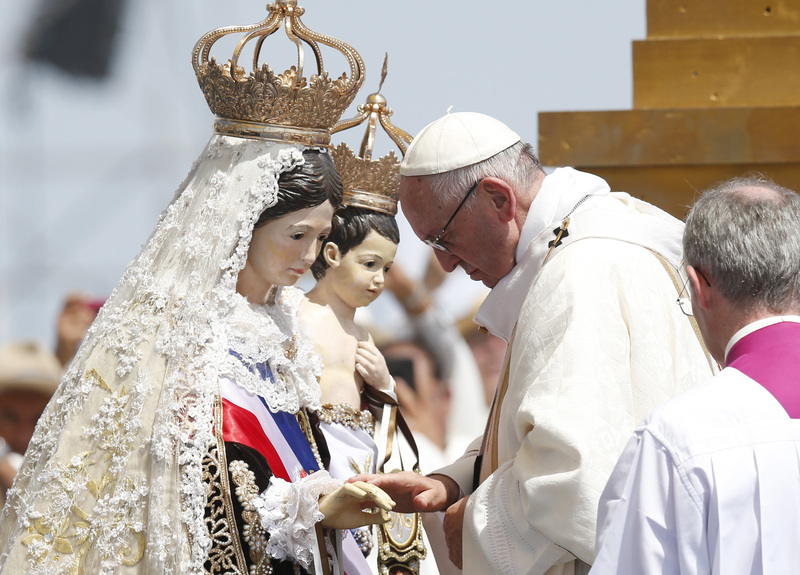 Pope Francis has decreed that “the Memorial of the Blessed Virgin Mary, Mother of the Church,” should be inscribed in the Roman Calendar on the Monday after Pentecost and be celebrated every year in churches throughout the world. The Congregation for Divine Worship and the Discipline of the Sacraments announced this in a decree published by the Vatican today, March 3, and signed by the congregation’s prefect, Cardinal Robert Sarah, and its secretary, Archbishop Arthur Roche. The pope, who has emphasized many times the importance of Mary in the church, approved this last Thursday when he received the cardinal in a private audience. A “memorial” is a lower-ranked feast day. Celebrations of feast days in the Roman Rite of the Catholic Church are distinguished according to their importance and named either as solemnities, feasts or memorials. The Memorial will celebrated on the Monday after Pentecost in churches throughout the world. The Vatican prelates in the decree recalled that “as a caring guide to the emerging Church Mary had already begun her mission in the Upper Room, praying with the Apostles while awaiting the coming of the Holy Spirit.” Then, in the course of the centuries, “Christian piety has honored Mary with various titles” that are in many ways equivalent” such as “Mother of Disciples, of the Faithful, of Believers,” but also under the title “Mother of the Church” as is found in the texts of spiritual authors and the magisterium of Popes Benedict XIV and Leo XIII. The authors of the decree recalled various initiatives by the Holy See and the local churches in the following decades that resulted in the establishment of a votive Mass in honor of “the blessed Mary Mother of the Church” (1975) that was subsequently inserted into the Roman Missal, as well as the publication of invocations and formularies. The congregation’s decree laid down that “the memorial therefore is to appear in all Calendars and liturgical books for the celebration of Mass and of the Liturgy of the Hours,” and provide the relative liturgical texts for this purpose. I hope he doesn't reconsider once he learns what his pal Luther said about Mary. In many instances, it seems that historically, Catholic leadership is the same as Muslim leadership only with bling. Just what Catholics need: another Marian holiday. This church is out of touch even with the 18th century. I think this is a nice thing for Pope Francis to have done. However, I just wish he would really sit down and think about what he is declaring with such a Feast. If Mary is the mother of Jesus, and God is Jesus' Father, which we all believe is true as Catholics, and then also Mary is the mother of all the church because the church is Jesus' body, and since lacking a biological father, his flesh can only be of his mother, and anyone who partakes of that flesh becomes a part of HIM, then when Jesus offered his body and blood on Holy Thursday, to both his apostles and disciples of both sexes, he was doing it in persona of his Mother for lack of any other person's possible flesh to do it in. So why then does our Pope refuse to treat and ordain women the same as men since believing women are In Persona Christi every day of their lives, and In Persona Mary as well, and so are all believing men who partake of Holy Eucharist? One can not be of Christ without equally being of Mary. Just as Eve is merely the completion and finishing of the one flesh, Adam and therefor is Adam or Man equally to Adam, so is Christ fully in Mary and Mary fully in Christ. Christ is the completion of Mary just as Eve was the completion of Adam. Does this mean that Christ should play a lower role than Mary? God Forbid!! His perfection became her salvation and immortality. However, God brings balance back to Man, as a creation, by having his son dependent entirely upon female flesh for his existence as man. Misogyny is devouring our church and rotting out it's heart daily. The time for change is now and we must demand it daily until it comes in full, with women ordained alongside their brothers, as priests and bishops, and made cardinals and popes. How odd that, despite the obviousness of Mary mysticism to you, it never occurred to the likes of St. Paul to write "Therefore if any man be in Mary, he is a new creature: old things are passed away; behold, all things are become new." It takes a woman, I guess. Apples and snowflakes - one of these things is not like the other: Our Lady is not a female Christ. She is, as St Louis de Montfort pointed out over 300 years ago, “less than nothing, in comparison with God”, so she cannot be swapped with her Divine Son. They are not comparable. So it would make absolutely no sense to apply that passage., Galatians 3.28, to her. For she is not Christ through Whom we have salvation, reconciliation with the Father, forgiveness of sin, redemption, renewal, and all else that comes to us through Christ. Kudos to the Holy Father for doing this. It is interesting that he did not, as he might have, appoint the 5th of August as the date, since that is the feast of Our Lady of the Snows in the old calendar. He is not really doing more than underlining what Paul VI did in 1964, when he gave Our Lady the title Mother of the Church. This shouldn’t be an ecumenical obstacle either.